July 2012 – He Said What?! Aaron loves Handy Answer Books. He will read a few pages of one of his Handy Answer Books every night before bed. Only before bed, mind you. Aaron will not read at any other time because……….well, because in Aaron’s world there is only one time for reading and that time is right before bed, after his teeth are brushed and all his pillows are placed just right and his back scratcher is positioned beside him in the perfect position and his lamp beside his nightstand is on and the nightstand is pulled right over to where it touches his bed and he and I have said goodnight and hugged and he makes sure that I am going to turn the hall light off and he has asked whether or not it’s going to rain. I think that’s it. There are many different Handy Answer Books on topics such as weather, dinosaurs, math, geology, etc. Right now Aaron is reading the Handy Answer Religion Book. Some day I will write a blog about Aaron and religion. He has some interesting insights into this sensitive subject. Anyway, this Handy Answer Religion Book has been eye-opening to him as he has read about some religions that he had never heard of before. For instance, Daoism was fascinating to him. We heard many facts about this unusual religion. Last night Aaron had a meltdown over not being able to play Spiderman on his computer. Gary put on another game, Shark Tales, that Aaron could play but Aaron’s Spiderman behavior keeps us from allowing that game. Therefore, Gary and I were mean and didn’t care and were some other things that Aaron chose to call us…………..and he slammed and banged and generally upset us all – even the dog. Aaron is like a balloon letting out air at times like this and we usually have to be sure that he lands safely. And he did finally land…………in the big easy chair in the family room, with a bag of tortilla chips and the TV tuned in to the Olympics. As we sat there, Aaron completely calmed down and acted as if nothing had even happened. He was happy and talkative and at ease. It’s always somewhat amazing to see the change in him – how quickly it happens and how he’s able to pick up like nothing was ever amiss. Gary and I are still licking our wounds, but not Aaron. After the very confusing up and down day that I had just experienced………………and the confusing up and down meltdown that Aaron experienced………….the religion of Confusionism sounded perfect to me! On most days, actually, I think I could write the whole chapter on Confusionism in Aaron’s Handy Answer Religion Book!! Living with Aaron can certainly have some challenges. Gary and I fight frustrations nearly every day as we live with our adult son…………..our son who has his own challenges that can at one time break our hearts and in the next few minutes be causing us to want to pull our hair out. We bite our tongues, or at other times wish we could undo what we just said. The years have helped to temper these episodes, but we still struggle. Then there are the times that Aaron is so funny that we laugh. Or our struggle may be to NOT laugh because of encouraging a negative behavior or an inappropriate comment…………..or because Aaron may not appreciate our laughter and so he will become angry. We’ve chewed our tongues more than once during those moments………….or shared knowing glances behind his back……………or waited for him to leave the room before we collapse in laughter. What Aaron doesn’t know won’t hurt him – and it sure helps us to feel better! Aaron has made some really funny comments over the past few days, so I decided to share some of them with you. Maybe they will lighten your day and help you to smile…………or laugh………….and you don’t have to worry about how it will affect Aaron. Aaron saw a small candle on the kitchen counter and asked, “Mom, can I have that light up candle in my room?” He knew the answer would be no, but he always thinks it’s worth a try to ask just one more time. Anything that “lights up” is not allowed in Aaron’s room. One of the staff at his day group, Barb, gave us a jar of grape jam that she made. I wanted Aaron to try it, so he agreed – a little reluctantly, because he just wasn’t sure that he would like it. And my instructions from Aaron were not to toast the bread – “Don’t make the bread crunchy, Mom. I want it soft.” So I spread some of the jam on the untoasted slices of multi-grain bread that I was using…………..the bread that has oats on the crust…………and watched him struggle to eat it. I finally asked, “Aaron, don’t you like the jam?” He answered, “I like the jam, but this bread has white crunchy things on it that are squares.” Leave it to Aaron to notice every tiny detail of his bread and to make faces like he was eating little cement squares instead of oats! 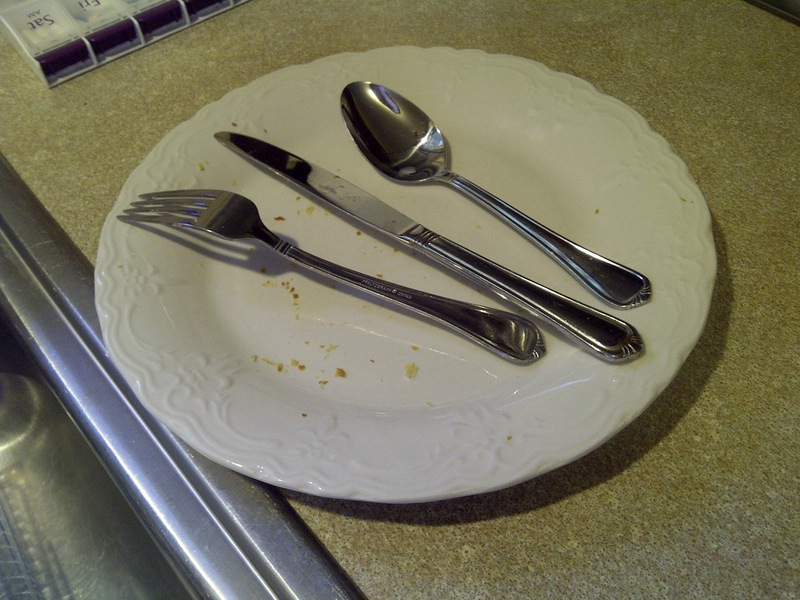 Yesterday after Aaron ate his lunch, the place mat under his plate was full of crumbs. Aaron has watched me shake the place mats over the sink to get rid of the many crumbs he leaves after he eats. He stared at the crumbs on his place mat and then asked, “Mom, how are you going to get rid of those crumbs on this place mat? Wiggle it?” Well, I guess you could put it that way, strange as it seems. We passed the water tower not far from our house as we drove around last night. Aaron thinks water towers are very interesting and always asks questions about them, so last night he made a comment about the tower. I affirmed that it was a water tower and he said, “It’s a water tower? I thought it was a sewer tower!” Ewwww! Of course, this was followed by a long conversation about sewers, until I finally told him – as I so often do – to google it! This morning he had yet another observation about his sore elbow and how it was folded under his chest in his sleep and was this why it was sore and would I say that this is why it was sore, etc., etc. And finally he came to this conclusion: “I’m guessing the muscle has been squished. It’s not squished into the normal position.” Ouch! If you don’t know what a mushing race is……………..google it! Last year Aaron became interested in football for the first time in his life. Many of you may remember reading some of my football blogs last fall and winter. Seeing football through Aaron’s eyes was – well – interesting. I was never more aware of the length of a football game than I was when watching it with Aaron, who talks and talks for a majority of the game. Football games are long………..very, very long. But it was very, very educational to listen to Aaron talk about the four rounds that comprise a football game; the refs in their jailhouse suits; whether the liquid that the players had squirted in their mouths was indeed mouthwash; which team we were voting for……………among a few of the many insights that Aaron shared of his understanding of football. And when the football season started, Aaron said the same thing that he said the other night when he saw that the Olympics was nearly ready to begin. Aaron saw the Olympics commercial on TV and became very excited. “The Olympics is coming out? !” Whereupon he clomped down to Gary’s study and exclaimed, “Dad! The Olympics is finally out!” Aaron makes it sound like the Olympics is the next blockbuster movie that he wants to see. In fact, one night after Aaron again told us that the Olympics was coming out, Gary asked him if they were coming out in 3D……………and that comment was totally lost on Aaron as he walked away, happy in the knowledge that the Olympics was coming out. He doesn’t quite understand what the Olympics really is and what they actually do in an Olympics. He asked one night, “What do they do on the Olympics? Different kinds of sports?” We’ve been trying to explain what the Olympics are for and what they do, including what sports are competed in during these summer Olympics. It’s all very new to Aaron, so we’ve been smiling a lot at his comments. The opening ceremony was of no interest to him, but he’s watched some of the competitions and of course, has a lot to say about what he observes. There are all kinds of Olympics, Aaron. And I’m sure we’ll be hearing all kinds of insights! Author hesaidwhatksPosted on July 29, 2012 Categories UncategorizedLeave a comment on All Kinds of Olympics! Author hesaidwhatksPosted on July 24, 2012 February 28, 2016 Categories UncategorizedLeave a comment on That Pillsbury Dough Boy! Well, today was the big day – the day that Aaron had waited for and talked about and anticipated for so long. Did I mention that he talked about it? A lot. He hoped that today would be THE day that his new (to him) desk chair would be delivered by Dad to our home and carried up to his room. And as I mentioned in the previous blog, we knew that Aaron would talk about it a lot this weekend. We were right. I sure was hoping that Gary was able to get at least one of the chairs that he bid on in the auction. If not, I knew a trip to the store for a new chair was a real possibility. This morning, Aaron did ask about it several times again – but he was far more interested in his croissant rolls that I was going to bake for him. That may be another story. When Aaron burst through the door this afternoon, home from his day group, he said, “Mom! When is Dad coming home?” Of course, what he really meant was……….When is the chair coming home?! I reminded Aaron that IF Dad was able to get a chair, then they would get home when they got home………..I wasn’t sure of the exact time. 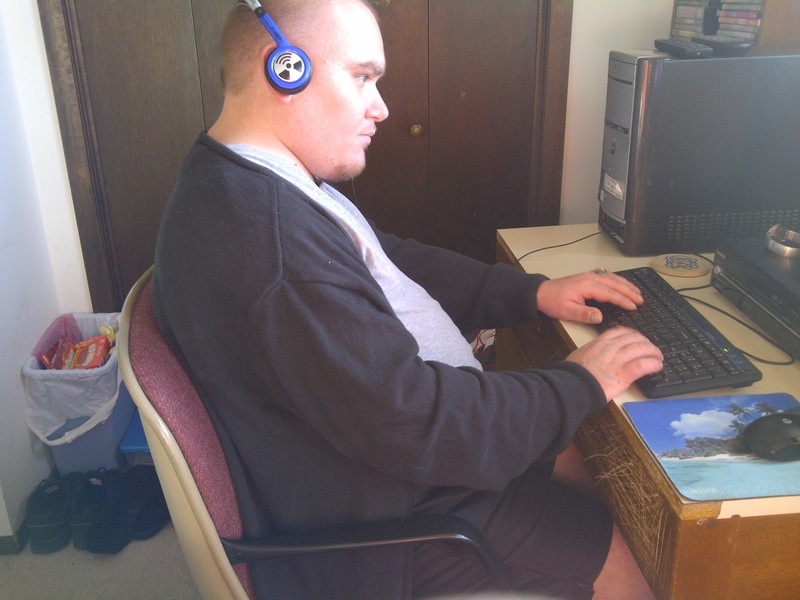 Aaron busied himself with his Kung Fu Panda computer game and totally lost track of time. 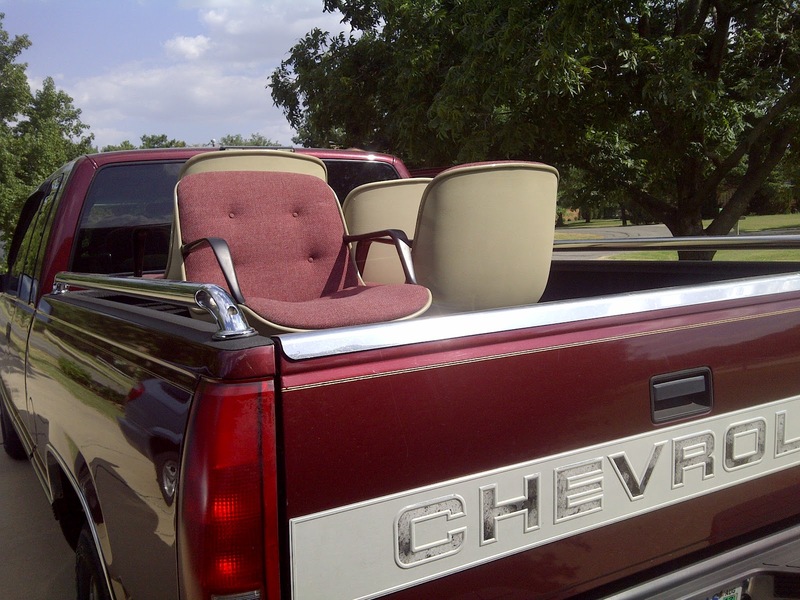 Gary pulled in later and sure enough, there were the chairs in the back of his truck. YAY!!! We were saved!! 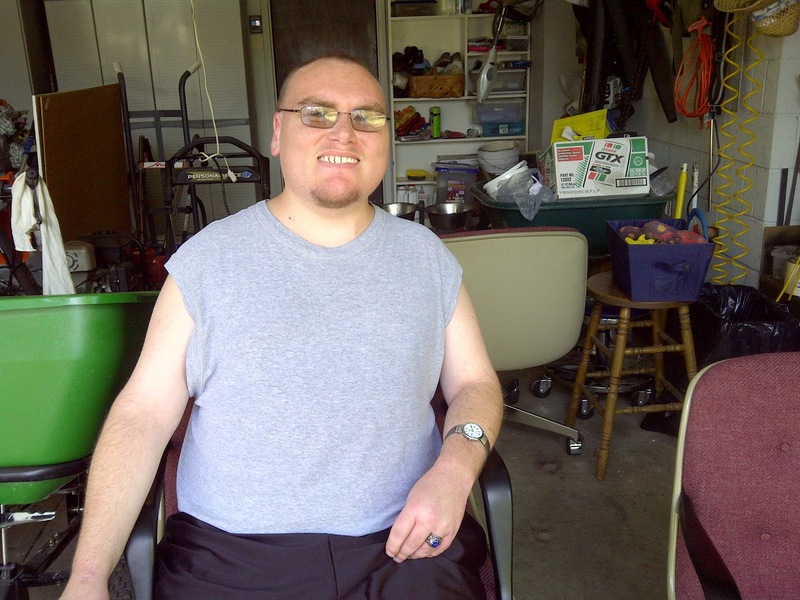 Gary and I were in the side yard when Aaron came downstairs and into the garage………..and saw the chairs. He was all smiles and happiness as he came out in the yard to tell us that he saw the chair. “Dad, you got a chair!” Yes, Aaron, Dad got a chair and now you can relax. Of course, as Gary said to me later, it won’t be long before there will be something else that Aaron wants or needs that will consume his thoughts and his talk. For now, though, we’ll enjoy Aaron’s happiness and hope that he’ll take good care of this chair. We do believe in miracles. And we love seeing Aaron happy. Author hesaidwhatksPosted on July 24, 2012 February 28, 2016 Categories UncategorizedLeave a comment on The Chair! For some time now, Aaron’s desk chair hasn’t worked correctly. To be specific, the pneumatic feature no longer operates. That’s because Aaron doesn’t usually just sit down softly in a chair. He drops. And when someone of his size drops into a chair, even the best pneumatic feature will eventually cease to be a feature and will become an operation of the past. Now Aaron’s desk chair sits rather low, permanently stuck where Aaron’s dropping into it left it………tired and refusing to cooperate with Aaron ever again. Aaron immediately wanted a new chair, but we decided to teach him a lesson and allow him to sit lowly in his chair for awhile. It’s actually been a long time that he’s endured this rather low position. In the meantime, Gary found out that there would be an auction at FlightSafety, where he works………….an auction of office furniture and so forth. Gary told Aaron that on the day of the auction, he would bid on an office chair for Aaron. It would be a nice office chair, but Aaron was going to have to wait for it. Aaron rarely waits in silence. Therefore, almost daily he has asked his dad about the auction. Was the auction today? It wasn’t? Then when will the auction be held? Are you still going to get me a chair? Why wasn’t the auction held yet? Will you tell me when the auction happens? When will it happen? Was it today? You get the idea. Many, many questions. Many, many comments. For many, many days. Aaron, Dad won’t be betting on the chair. It’s called bidding………….it’s an auction…………where you bid…………not where you bet. Never mind. And are you telling everyone that your Dad is betting on a chair? Do I need to clarify some issues with your staff and friends at Paradigm? Yesterday Gary came home from work and gave Aaron the good news. The auction was held and Gary did indeed bid on the coveted chair. He will hopefully bring the chair home on Monday. Of course, Aaron is very happy to hear that on Monday he will have a new (new to him) chair. Poor chair. But we have instructed and instructed Aaron about how to sit in the chair. How to sit and not drop. We’ll see how this goes. And it is not a pneumatic chair, but one that spins in order to be lowered…………or highered, as Aaron says. I may someday have a spinning story to tell, knowing our Aaron. I’m sure that the instruction time will be very fascinating. Aaron doesn’t appreciate sarcasm like you and I might. Aaron lowered his voice and said for only me to hear, “If he keeps talking like that to me, then I’m gonna be mean.” It was just too funny. We’ve praised Aaron for how pleasant and nice he’s been this week, for the most part, so this threat to be mean was the best way he could think of at the moment to get back at Dad for his sarcasm. Gary heard the conversation and we burst out laughing while we watched for Aaron’s reaction………….and there was none, of course. Aaron had made his point and we were, in his mind, to be forewarned if we did not straighten up our attitudes. Never mind his. Aaron has since asked Gary again about the chair. I should keep count of the number of times we have this chair conversation this weekend. It makes me want to grab a trash can and go sit in the mulch! I think Gary might join me. Aaron has been counting down the days – literally – until he was to get his permanent crown put on. Out of the blue he would say, “Seven days, Mom.” Then the next day it would be, “Six days, Mom.” Well, today was the day. He had been a little worried about whether or not it would hurt – would he need another shot – would he be numb and unable to eat for awhile (his biggest concern, by far) – and of course, would we eat lunch out somewhere? He was relieved to hear that it would not hurt – that he would not need a shot – that he would not be numb and so he could eat – and that yes, we would eat lunch out somewhere. Life is good. 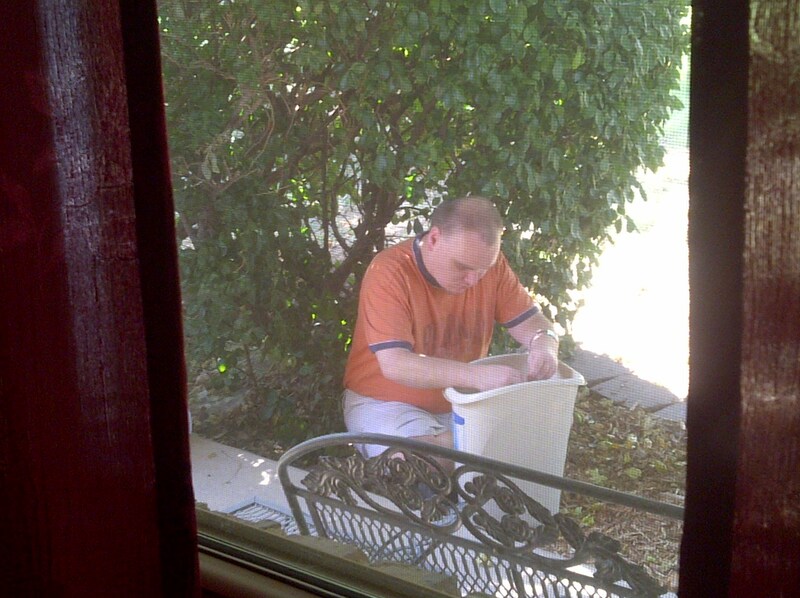 I was doing some yard work this morning and Aaron was on the computer. After I got out of the shower, I checked his room and found it empty. There he was, out in the mulch, doing his relaxing “mulch thing.” He doesn’t mind all the box elder bugs around him. He was in his own world, relaxing and gearing up for lunch and then the dreaded crown. Before long, we were pulling into the parking lot at Chili’s. For some reason, he wanted to remind me at that moment of the time he threw up all over his carpet several months ago…………and how he was sure it was because of eating a Subway sub………….and that he doesn’t want to eat at Subway ever again. And I reminded him that it probably wasn’t the sandwich at all, but maybe all the extra cheese he requested……….just like the extra butter on his theater popcorn. He replied, “So Mom, are you saying that my body is not made for extra cheese?” Little did we know how interesting his lunch soup was soon to be. Aaron wanted the spiked lemonade that the server mentioned, but instead settled for strawberry lemonade. His face puckered at the first sip, and he leaned over to examine the contents of his glass. “Mom, what are those spots?” I assured him that they were just strawberry seeds and he was relieved. We both ordered the Chicken Quesadillas from the lunch menu, along with soup. Aaron was excited to see that they had Loaded Baked Potato Soup. His experience with that soup on Saturday night was positive, so he was looking forward to another bowl of this tasty soup. The server and I had a time, though, explaining the Quesadillas to him. It was pretty comical and she was a good sport, but I finally just told him that he would like them and let’s just order. Goodness! Did he want us to draw a picture?! You do not need every little detail of these Quesadillas explained, Aaron! Are they flat? Are they soft? Are they hot? Are they cheesy? Have you made them, Mom? AAAHHHH!!!! His soup came and he cautiously dipped his spoon in, unsure of this new dish piled with green onions and bacon. It didn’t look like Saturday night’s soup. It turned out to be very cheesy………..VERY cheesy. Weren’t we just talking about too much cheese? It was quite interesting to see him eating this VERY cheesy soup. 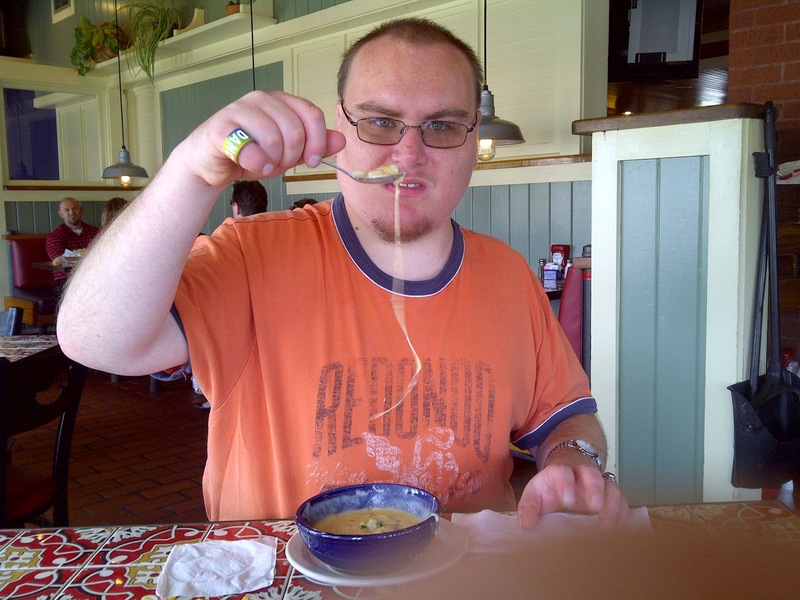 Aaron was very appropriate to finally call it “Stringy Soup”……………..for it certainly was stringy! It was actually hilarious to watch him try to grab the strings of cheese hanging off of his spoon, then see the cheese wrap around his fingers or land on the table. He wasn’t frustrated, but did do a lot of grunting and sighing. Four napkins and two glasses of lemonade later, he had finally conquered the soup and was able to move on to the Quesadillas and fries. See the napkin he removed from under his bowl? Napkins do NOT go under bowls! He separated his fries from the Quesadillas, eating the fries first – each one dipped methodically in his ketchup. The ketchup reminded him of blood and we had a nice little conversation about red blood and white blood. You just never know where things will go with Aaron, because blood led to…………of all things………..lab tests and urine samples and “Mom, what does a hospital do with all that pee?” He wasn’t being gross or silly, so I tried to engage in this conversation in a very scientific way……..without laughing. I was glad when he moved on the Quesadillas, leaving the ketchup behind, where all he wanted to know was, “What is the middle part of that white thing? It tasted weird.” Huh? Of course, he wanted to use the bathroom before leaving…………and to wash his hands with an unknown number of paper towels for drying………….and as he walked to the bathroom, through the tables full of people, I wondered what people thought of his unusual way of walking and his total oblivion to being so unique. I’m thankful he doesn’t care about all that, and I sometimes wish it didn’t stab at my heart so much. I also wish I wasn’t embarrassed at how loudly he clapped when we finally stood up to leave. Not one clap, but two…………VERY loud claps, as only Aaron can clap. He was so unaffected and I was so aware of people’s stares. Outside, I asked him why he was clapping and he just said it was because we were leaving. It seems to be a release for him………..and I think it’s so amazing that he doesn’t see it as loud or strange. On the way to the dentist he told me about how when he and Dad had gone to DQ, they had passed a “company building that had a tanning cleaning place.” Sure glad I can read between the lines with Aaron! And I wish I could tan while I clean! His crown insertion was very quick and painless; buying some DVDs at CD Tradepost was fun; and listening to the Beach Boys on this hot day was the thing to do. Of course, Aaron had to remove the insert from the DVD box and stare at their picture, finally asking, “Which one has the weird voice?” Oh Aaron – always listening but so unaware of how you appear or sound to others. Our last stop was to run in and get his hair cut……..while he talked to the hairdresser about how he hopes we can take a vacation in October and where we might go and who called our house that morning and “MOM? Who called while you were in the shower?” For crying out loud, Aaron! EVERYBODY in Great Clips can hear you!!!!! But if I don’t answer he will repeat it, shower part and all. And of course, before he left he had to tell them all about his new crown and how that dentist “shoved it in my mouth!” Wonder why no one asked for a referral? If Dr. Baxter only knew! A day with Aaron………….never quiet, never dull, never routine…………sometimes never ending, it seems. And I have to smile. Author hesaidwhatksPosted on July 19, 2012 February 28, 2016 Categories UncategorizedLeave a comment on Crown Day!